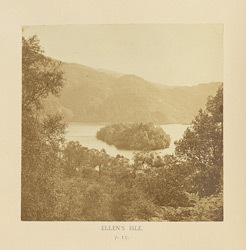 View of Ellen’s Isle (Eilean Molach), a mysterious lake island ringed by wooded hills on Loch Katrine in Scotland. It is one of 13 landscapes photographs by Thomas Ogle illustrating an 1863 edition of Sir Walter Scott’s long narrative poem ‘The Lady of the Lake’. The image accompanies a passage describing a lost huntsman’s love-struck sighting of a beautiful young woman in a boat on the loch. She is Ellen Douglas, the ‘Lady of the Lake’ and daughter of an outlawed clan chief, James of Douglas, the Earl of Bothwell, who has been exiled by the King. She thought to catch the distant strain. Scott (1771-1832) was the author of immensely popular historical novels and poetry. Their combination of history, chivalry and romance was especially beloved by readers of the Victorian era. ‘The Lady of the Lake’ (1810) was the third of his epic narrative poems inspired by the landscape and legends of Scotland, and tells the story of the uprising of Clan Alpine against James V, the King of Scotland, led by Roderick Dhu, a rebel Highland chief. It is set in and around the beautiful mountains, glens, lakes and forests of Perthshire and Stirling in central Scotland. The great success of the poem made Loch Katrine and the Trossachs a fashionable destination for 19th-century sightseers.